31.10.2014. Head of UNDP in Georgia Niels ScottThe Lagodekhi Protected Area presented its new system of biodiversity monitoring and poach trackingMinister of Environment and Natural Resources Protection of Georgia Elguja Khokrishvili and Head of UNDP in Georgia Niels Scott visited newly opened touristic tracks and souvenir shops The Lagodekhi Protected Area presented its new system of biodiversity monitoring and the tracking of poachers, and first achievements in developing environmental tourism on October 29. 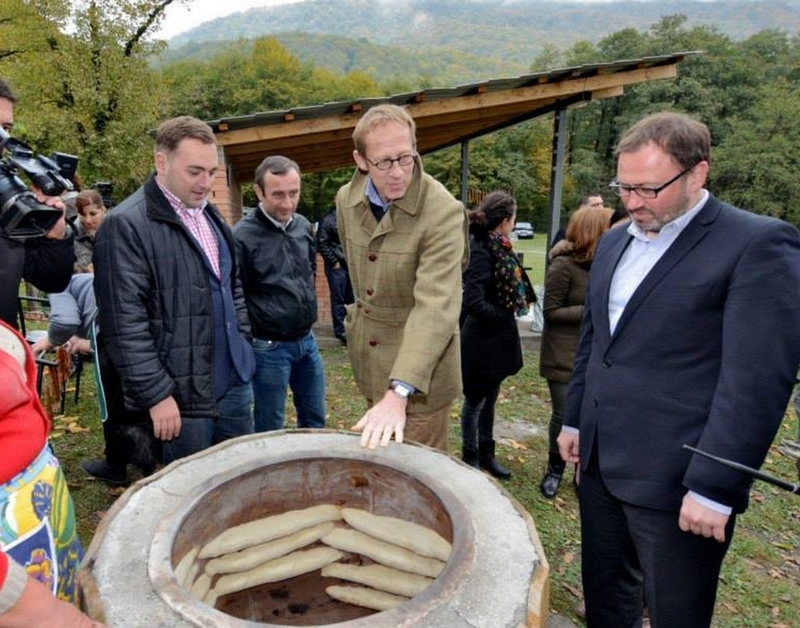 The event was attended by the representatives of the Ministry of Environment and Natural Resources Protection of Georgia, United Nations Development Programme (UNDP), local government and environmental organizations, as well as residents of nearby villages. Minister of Environment and Natural Resources Protection of Georgia Elguja Khokrishvili and Head of UNDP in Georgia Niels Scott, visited the newly opened touristic tracks and souvenir shops. They also met with the residents of the villages Gurgeniani and Ninogori who plan to be involved in touristic activities. As the start-up assistance to the environmental tourism, Khokrishvili and Scott presented a collection of souvenirs to the local shop and five horse saddles to the local residents interested in launching horse riding tours. They also handed over the equipment for biodiversity monitoring and poach tracking to the administration of the Lagodekhi Protected Areas, including backpacks, photo tracks, cameras, binoculars and radio sets. Support to the Lagodekhi Protected Areas is a part of the Small Grants Programme of the Global Environmental Facility (GEF) implemented by UNDP in cooperation with local partners. Since its inception in Georgia in 2012, the GEF/UNDP Small Grants Programme has funded up to 32 environmental initiatives for a total value of USD 730,000. Cash and in-kind contributions received from the local governance, communities and other donors made up to USD 926,000. “Our program aims at improving the social conditions of locals and also the protection of bio diversity on the protected area” stated Khokrishvili. “Our joint efforts help one of the most beautiful and environmentally rich protected areas in Georgia – Lagodekhi, to improve biodiversity monitoring, enhance the tracking of poachers and develop environmental tourism. It is encouraging to see the tangible results of this initiative – the improved system of bio monitoring, better equipped rangers, new tracks for tourists, souvenir stalls and other touristic services. The UNDP is proud to be part of this success. We are happy to support a local initiative which sees development of the Protected Areas from both sides – the environment and people, and makes sustainable management of environmental resources beneficial for the nearby villages,” stated Scott. Director of Lagodekhi Protected Areas Administration Giorgi Sulamanidze said that more people will be involved in the project in the future. Local people involved in the project stressed that their condition has improved. “We have always done our best, but with new equipment it is easier. We have already caught several poachers through new online cameras,” said a Ranger Kakhaber Keloshvili.